Oysters are for the chosen few. Not exactly in the mainstream, they do provoke passion. About as many love them as flee from their sight. My first oyster encounter was in my baby days and the first beverage I liked with oysters was beer. Traveling early on to New Orleans where oysters ruled-raw, baked, in stews or soups- was a great leap forward to wines as part of the oyster ritual. Biologists swear that Oysters are able to change gender. During the early months of life, they are, I’m told, bisexual. With this first change in season most become male. After a year, they are predominately female. This parallels wine progression: fermentation, time in the barrel, bottling, cellaring and pouring. Pairing wine with oysters is yin with equal parts yang. Louisiana oysters are larger than most, saltier at times, and fuller flavored than some of the Northwest or Nova Scotia oysters, which tend to have a higher iodine content and are smaller. Gulf oysters from Apalachicola, Florida have plenty to recommend them, and Kumomtos from the Northwest are known by many as the darling of oysters. Jonathan Swift proclaimed that, “He was a bold man that first eat on oyster.” They don’t call America the home of the brave for nothing. This recipe has been adapted from The P & J Oyster Cookbook, by Kit Wohl and the Sunseri Family (Pelican Publishing Company, Inc. 2010). This full-flavored dish from Dickie Brennan’s Bourbon House in the French Quarter of New Orleans delivers a nice splash of color and a lot of zesty flavor. Heavy cream and grated cheese add their richness to a spectacular creation. * Tasso ham is a heavily-smoked ham with a spicy, peppery rind. It is often used in Cajun dishes . If you can not find this ham, substitute smoked ham or Canadian bacon. rain the oyster juices (the liquor) into a measuring cup to remove grit. Reserve 1/4 cup of the juicesr and refrigerate or freeze the remainder for future use. Scrub the oyster bottom shells clean under running water. Place the cleaned oyster shells on oven-proof baking pans or rimmed baking sheets; set aside. In a large frying pan over medium heat, heat the butter, being careful not to let it brown. Add the sweet red pepper, red onion, and jalapeno chile pepper; saute until the vegetables are softened. Add the tasso ham and sautto heat thoroughly. Add the tomatoes and cook until they start to break down a bit, then stir in the thyme. Add the white wine, and stir to deglaze the pan. Add the flour and mix well to incorporate, then reduce the heat to medium and cook and stir for about 5 minutes. Add the 1/4 cup of oyster juice and the cream; mix everything together again until smooth. Fold in the cheese. Season the mixture with salt, black pepper, and cayenne pepper to taste. Remove the filling from the heat and allow to cool. Place one (1) fresh oyster on each bottom shell on the half-shell tray. Using a spoon or piping bag, top each oyster with some of the vegetable/ham mixture and sprinkle each with some of the bread crumbs. 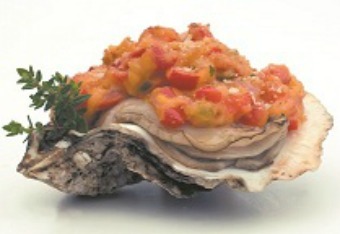 Bake for 12 to 14 minutes, or until the bread crumbs begin to brown and the oysters are bubbly. Remove from the oven and serve immediately, taking care not to burn yourself when transferring the hot shells to the serving plates. Presentation Suggestion: At Bourbon House, they serve the Oysters Fonseca on a bed of rock salt mixed with dried chili peppers and black peppercorns in French roasting pans. Pairing Tip: A crisp, light, sparkling Italian Prosecco, or reach for a bolder taste in a big Italian red. Doc Lawrence is a veteran food and wine journalist based in Atlanta and Fort Lauderdale. Doc Lawrence writes and lectures regularly about subjects in which he is a recognized and acknowledged expert – wine and food, theater, travel and cultural tourism, visual art and music. His works have earned praise from many editors and publishers. Check out all of Doc’s Sips Across America articles.